Cindy Nicholson is a former teacher and corporate trainer who helps entrepreneurs design and develop online courses that get real results. She calls herself the Course Whisperer for her keen ability to turn the incredible knowledge of her clients into effective and engaging learning material. 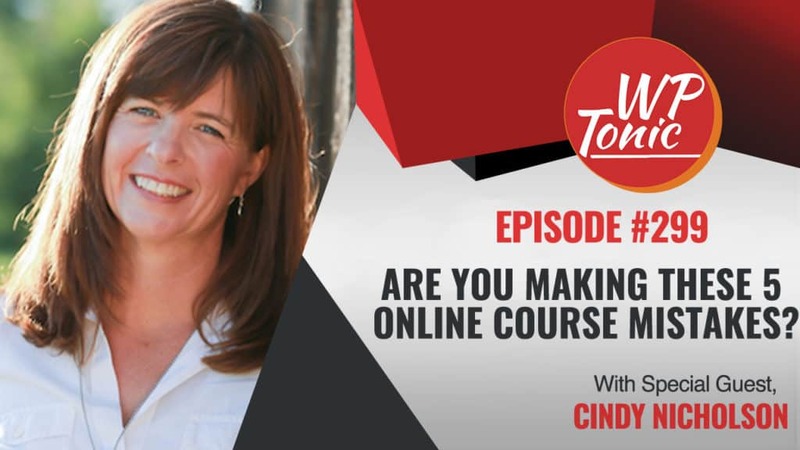 After years of creating training programs in the corporate world, Cindy wants to help entrepreneurs level up their online courses so that they create loyal, raving fans. Jonathan: Welcome back folks to the WP-Tonic Show. It’s episode 299. We’ve got a great special guest here. We’ve got Cindy Nicholson, the Course Whisperer with us. Cindy, would you like to quickly introduce yourself to the listeners and viewers? Cindy: Hi Jonathan. Thank you so much for having me on today. Yes, as Jonathan mentioned, I’m the Course Whisperer from thecoursewhisperer.co where I help entrepreneurs create the content for the online courses that they want to create. Jonathan: All right. How long have you been doing that and where are you based, Cindy? Cindy: Well, I’m based just outside of Toronto, but I’ve been developing courses and training for probably over 12 years now, more specifically helping entrepreneurs with online courses just over a year now. But I started out actually as a high school teacher. I was a high school teacher, Phys Ed and Math teacher for a few years. Loved teaching, but didn’t love the teaching subjects. So, got interested in the Financial industry and moved over into the Financial industry, but missed the teaching. And so, I ended up landing a cooperate training job where I got to train Financial Advisors that were new to the company. And so, I loved doing that as well. I then decided to stay home for a couple of years with my kids. And once you get home and get out of the grind of driving downtown all of the time, I decided to go back to school to study Nutrition. So I have a varied background. And while I was in Nutrition, I discovered this online world and realized that in the courses that I was taking, number one, there was a lot of gaps in the courses that I was taking. And number two, a lot of people that I was doing these online courses with were looking for help from people to help them organize things. So, I spent a lot of time doing that and realized that there was a lot of need out there for people that wanted to kind of articulate a message, but didn’t know how to craft it in an effective way. So that’s how I ended up moving over into this world. Jonathan: Oh, that’s great. Thank you for that Cindy. So, it’s a major tagline on your website, “You are making these five online course mistakes”. Shall we delve into maybe what these five mistakes are? Cindy: Yeah. So, having taken a number of online courses myself, I kind of see these mistakes over and over again when I get into courses. For me, I want to be able to create courses that I want to take. And number one, probably the biggest thing that I see is that these online course creators are just providing too much content. So, they want to provide as much value as they can and they feel the best way to do that is to provide content. So, they have these 30-minute or 1-hour videos of training in their courses and it’s just way, way, way too much information. So, that’s one of the biggest things that I see is the first mistake is really that they’re creating too much, they’re providing too much content. And really what the objective is or what you’re trying to do is really kind of the second mistake is there’s no real clear outcome for the course. So, often people if they have a particular skill set, you may want to teach a course in SEO or teach a course in How to Create a Website. But a lot of the courses aren’t designed around having a specific outcome. So, what I mean by that is that they’ve created all this content of all of these things that they should know, but aren’t focusing that content around a specific outcome. What will the learner get by starting at your course and finishing your course? And so, I often see that with, which also lends itself to having too much content. Because if you’re not super clear on what your outcome is, then you end up throwing in a bunch of information that may not necessarily apply to that particular outcome. So, to combine with the whole too much content is the third mistake that I see which is not enough activities. So, often course creators are thinking, “Well, if I just tell them, they’ll learn it.” And unfortunately, that’s not the case. So, often these courses have just a bunch of videos and that’s all that’s available and there isn’t any type of activity or application exercise and I’m talking about more than just quizzes. I’m talking about how can they start to apply what they’re learning in the real world. And so, that’s the other mistake that I see out there is that I don’t see as many activities included or application exercises after each of the lessons that are being taught. Would you agree with that Jonathan? Cindy: And so, the fourth thing, when I’m thinking about, when people are putting content together is that they, what I like to do is I like to have my clients create some sort of journey where they start here and they go through this step, this step, this step, this step to get to the final journey. And what I like to have my clients provide, is to show a visual representation of what that journey’s going to look like so that as they’re going through the course, the clients know exactly, you know, “I’m in Step 1 and this is what I’m going to learn. Now, I’m in Step 2 and this is what I’m going to learn.” It allows the brain to kind of really understand the progression of what they’re about to learn. So I don’t often see that in online courses. Often I’m showed all of the information I’m going to learn, but not how it all fits together in a nice package. That’s one of the other mistakes. I’d like to see online courses provide like a journey or a visual representation of the overall direction that the course is going to take. And then, the last mistake, and you might relate to this one as well Jonathan, is often people will wait to finish the course before they start doing anything about it from a Marketing perspective or a communication perspective. And they’ll be like, “Well, I’ll wait until this is all done and then I will market it and then I will launch it and then I will do all the other work behind it.” And often both of them can be going on at the same time. And so, I encourage my clients that if I’m working on the content for them, that they can continue or start to work on the Marketing materials that will help them get people buying it once this course is ready. They can kind of start to build that hype. Jonathan: Yeah. I totally agree with all your points, but I think your last point is a real biggie because of a couple of factors. Market fit is not easy, even if you’re an experienced online Digital Marketer. What you think your audience should know and what problems that you think you are solving in your course and the great value that you’re offering, when you actually start Marketing, you find the opposite, that the actual target audience does not feel the same as you about your fantastic course and that can be a bit of a shock, can’t it Cindy? Cindy: Yeah. And that’s what I recommend always with my clients is to take that first step. Before you start creating anything is make sure that people are going to buy it. So, you need to validate your idea with your audience before you actually start putting anything together. And you can do them at the same time in terms of creating like a beta course or something and so you create it as you go. But even just validating the idea to make sure that people are going to buy it once you’ve got it. Again, it’s all well and good if you think it’s a great idea, but you’ve got to ask your audience to see if that is actually going to be the case. Jonathan: I actually think the kind of language utilized in the startup community is quite relevant to the membership and course building community. They use a term like minimum viable product. That’s utilized a lot in the startup community. And I think having a kind of mini-course that you could initially sell and then at some stage when you build up the big course, you could offer it as a bonus or it could be a free course at some stage, but building a mini-course just to test at a very reasonable price just to test the market fit and also the feedback you’re going to get from those initial users. What do you think Cindy? Cindy: Yeah. I agree. It’s funny. I’ve said this before. Creating a course is just like creating a small business. All of the steps that you go to, to create a business you kind of go through so similar steps when you create a course is you want to make sure that you have an audience, that there’s a need for it and that you want to start out with creating some sort of, as you say, minimum viable product in order to be able to test the waters. Both to get feedback from your audience, but also to see whether or not you’re actually solving the actual pain point that your clients are actually having. Jonathan: Yeah. You’ve dealt with a lot on the content level, but it must be heart-wrenching when you have people spend a lot of time on content, but they find that they’re getting people to sign up for the course, but they find that they’re going to have to do a major rewrite or a major pivot really. Cindy: Yeah. That’s why it’s so important to do that legwork up front because if you get that validation up front, then there’s less rework, redesign done at the back end. Because, you know, it does take time to put that content together so you want to make sure if you’re going to be building it, that you’re doing it the right way, for sure. Jonathan: So, what do you think, based on your experience, what is a really great starting, kind of mini-course? What should you be providing in that mini-course, the size and what should be in it? Cindy: Well, it depends. But, when you go to your audience, find out what, you know, an urgent pain point that they have that isn’t solving world hunger. It’s how do we get the first win out of what might be a larger journey, but really focusing on an urgent. Because you want it to be urgent, otherwise, nobody’s going to sign up, an urgent pain point that you can solve. So it may just be five videos with activities that could be packaged around just a small pain point, but that’s really what you want the focus to be. If you’re teaching someone how to, let’s say, create a website, what is the first thing that you can have them do and get that solution solved for them so that if they solve that, they’re ready for the next step. That’s why if you do a good job at the outset, then they’re going to be sold as you go further down the road. Jonathan: That sounds great. I think we’re going to go for our break folks, but before we go, I want to tell you about one of our great sponsors of the WP-Tonic Show and that’s LifterLMS. 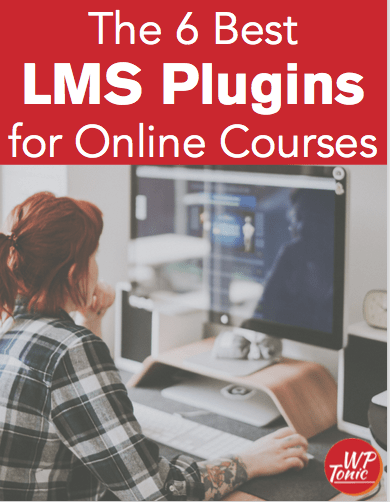 LifterLMS is one of the leading learning management plugins for WordPress that you can get for free. The core plugin is totally free. They have bundles of premier functionality which you can buy additionally that will make it even more powerful for your Membership Learning Management System and they’re a great sponsor of the WP-Tonic show. They’re offering a 15 percent off all their bundled products, their premier add-ons. If you use WP-Tonic, all one word, you will get that 15 percent off. You will find a link on the show notes of this episode and on other show notes with the coupon code WP-Tonic and you can use that and get 15 percent and utilize their great plugin. We’re going to go for our break and when we’re going to come back, we’re going to be delving more with Cindy and course building and just great general advice. We’ll be back in a few moments folks. Jonathan: We’re coming back. We’ve had a good discussion about course building. Been a bit depressive if you’ve got all the mistakes but be cheered. If you follow Cindy’s advice, you will get a great course and it will be fantastic. Right, Cindy. Like in our pre-show chat, like I was saying to you, I find that people and it’s linked to what we’ve been discussing in the first half, people either build a whole course out before they do any kind of Marketing or testing or they want to knock it out really quick and they think that’s going to be the final product and people are going to give them like thousands of dollars. Have you found that? You get kind of a lot of people with one extreme. And how do you handle the reality that you’re going to have to break to them basically? Cindy: Yeah. Creating an online course is very glamorous these days in terms of, create a course and you’ll bring in thousands of dollars and I don’t think the understanding of that, in order to be able to do that, you need to be able to produce something of good quality. So, you may get the initial hits in terms of people buying your product. But what you’re looking for, well, my assumption is people want to have an enduring product where people will refer and love it and send other people to your course. I tend to get people who want to build a massive course and want to solve everything within the massive course. Jonathan: World hunger. I call them the World hunger. Cindy: Exactly. I’m usually pulling them back from, having them really be more focused. I think that we’re moving into an era of just in time learning. And what I mean by that is people aren’t necessarily going to be taking a course on how to set up an online business, this massive course of how to do it. They’re going to be like, “Okay. I need real help on how to do X. So, I want to find a course that will help me solve for X.” I think there will be less tendency for people to buy these massive courses a lot because some of them have been burned before because they’ve invested all of this money and they’ve gotten into the course and it hasn’t given them the result that they’re looking for. So, I think there’s a lot of people who are a bit disenchanted with online courses and so they may be less apt to forking over the cash. Maybe it’s because it’s happened to me that I kind of begged off these massive courses and now really looking for courses that are going to solve a particular problem of mine in the shortest period of time possible which is important. So, I’m usually finding the people who want to do the big courses and I’m pulling them back and having them more focus on what specific pain point. And then, they can maybe build four or five courses rather than having just one big large one. One of my clients right now, she’s a functional medicine doctor and she’s building a course. She wanted to create an all-encompassing, be a practitioner and learn the methodology all in one and we’ve actually broken it down into four different courses that the clients can pick and choose depending on what their need is at the time. Ultimately, they could take all four, but to have it broken down into smaller courses that solve particular pain points is I think where a lot of the clients are what they’re looking for nowadays. Jonathan: That’s great. I think modification, I actually don’t think there’s a word. I’m notorious for making my own words up Cindy. But I think breaking it down into smaller courses, getting that feedback from the users that are utilizing it and now in that feedback to modify future courses in the big membership package is a very sensible outlook really. I think also in the actual industry as a total drop out is quite a big problem. I would say it’s linked to what you just said. What do you think? Jonathan: Terrible, isn’t it? They’re going to actually have to do some work. Cindy: Exactly. And number four, the quality of the content isn’t very good. They just are not getting what they needed from the content itself which comes back to that whole being specific on your pain point, being clear on your audience, who your audience is actually going to be taking the course. Because if your audience is too broad, then you’re going to have to much content in there that doesn’t apply to each specific individual. And as adult learners with a multitude of different distractions, as soon as you start talking about something that doesn’t apply to me, I’m out. I’m gone and I’m not coming back again. So that’s why it’s really important to have like that specific outcome but also have a very clear audience as to who’s taking the course so that you can keep that information targeted to them. Jonathan: Yeah. I’m getting a good picture here why having some advice and thinking about this is probably wise, isn’t it? Because even on the course, we’re not touching the technology side of it, but just the course marketing, there’s a lot of balls to think about, isn’t there Cindy? Cindy: Well, and that’s the thing. It’s funny because often when I’m talking to people about what I do, they’re like, “Well, I know the content. I don’t need somebody to help me with the content.” There’s one thing about knowing the content versus teaching the content and that’s really kind of where my expertise comes in is really like how do you convey everything that you know in a way that makes sense for your learners. That’s what you want. You want your learners to absorb the information, but then apply it. And so, it’s an Art and a Science, but there’s little tips and tricks that can help you along the way to make it more effective from that perspective. Jonathan: I’ve got a question that’s linked to what we just said. Back to the first half of the show, I said that there’s a lot of terminology that you can apply from the startup community. Another term that they use is onboarding. Is this a thing that you find that a lot of people don’t think about when they’re developing their course, the onboarding? And I’m just going to give the listeners and viewers a quick synopsis of what onboarding means in the startup community because you might not be aware of the term folks. Onboarding is you sign up for a SaaS product, a service and basically, there’s, it can be a group of email that’s sent to you saying, “How are you getting on with the onboarding?” They can offer a one to one initial onboarding Skype or Zoom call. They can send you to specific resources that have been developed for the person that’s starting to utilize that product and service. So, to make sure that you keep using the product and you don’t stop using it and then cancel your monthly subscription. Is this an important area to consider, Cindy, when it comes to memberships? Cindy: Well, when you think about it, when somebody buys an online course, that is the most motivated that they’re going to be to go through the course. So you want to capture that. And so, they sign up for your course, they see your Marketing materials and it promises all of these wonderful things. So they sign up and they pay their money and now they need to do the course. And so, spending time thinking about what you can do to get them into the course and get them comfortable with how the course is laid out, how the course is structured, why you’re teaching what you’re teaching, having that process at the very beginning is super important to allow that motivation to sustain itself. Because they’re coming in, they’re all excited, if they then get confused or don’t know where to go or how the course is laid out, that will quickly drop that motivation level and it will be hard for them to come back into it. So, onboarding is such a super important element to creating that really positive experience right at the outset. It kind of sets the tone for the rest of the course. Jonathan: And when it comes to onboarding, have you got any examples that you’ve seen or worked with that you think they were doing it in a good way when it comes to a course? Cindy: Well, it’s interesting. I took a course last year. I’m sure of the technology, maybe you would know if it’s available. But when I signed up for a course last year, they must have triggered where I was located and the email came out addressed to me and made a couple of comments about, because I live just outside of Toronto so I’m Canadian. So, Tim Hortons is a coffee shop that’s very near and dear to our hearts. And so, there was commentary about, that initial email was actually very personalized to me even though I’m sure it was just generated somehow. But creating that kind of initial connection with the audience is really good. And then, once you get into the course, providing like navigations. So like a welcome, but how do you navigate around this course. So, where do you go first? Where do you go next? Because they’re kind of on their own on the other side of a computer. So giving them as much direction as to what to do gives them the most peace of mind. Jonathan: And it has the benefit also of reducing the support tickets that you will get. Do you find that’s another area people forget is how much support they’re going to have to offer their members? Cindy: Absolutely. When often people are thinking online courses, they’re passive income. They’re not. Jonathan: There’s nothing passive about them, is it? Cindy: Exactly. So that can be quite discouraging, especially if the Marketing material talks about passive income, create an online course and just see the money roll in. If you’re wanting to create something of quality that’s sustainable, there is definitely some legwork around it. And so, there’s a lot of things like updates, like customer service, all of those things that are involved in that ongoing process of having a course. Jonathan: Having some thoughts or thinking about the onboarding side of it can reduce. Because normally, unless there’s some fundamental problems, it’s normally in the first few weeks of somebody joining a course that you’re going to get a lot of support tickets, aren’t you? Cindy: Yeah. Exactly. One of the things I tell my clients is any time they do a video, when they finish the video, be super clear as to what the next step is supposed to be. If it is to download something or print something off, be super, super clear. Hold their hand as they’re going through the course so that they know exactly what they’re supposed to do because they’re in a space that is unfamiliar to them so you’re kind of like the tour guide taking them through it. So just be super clear every time. What is their next step? What should they be doing now? Jonathan: I think that’s great. We’re going to wrap it up now folks for the podcast part of the show. But Cindy’s been gracious to say she’ll stay on which you’ll be able to watch on the WP-Tonic website, this bonus content and on our YouTube channel. Like I say, we’re going to wrap it up for the podcast. Cindy, how can people get a hold of you and learn more about what you’re doing and more about how you can help them with their courses? Cindy: Well, Jonathan, if people want to learn more about me, they can visit my website at thecoursewhisperer.co. It’s interesting .com just became available this week so I actually was able to get it because before it was way too expensive. So it was very exciting. Anyway, thecoursewhisperer.co. And then, for your listeners, if they are interested in getting some free resources from me, they can go to thecoursewhisperer.co/wptonic and I’ve got a course outline guide. I’ve got a free mini-course. We were talking about how important it is to validate. There’s a free mini-course there on how to validate your course or if anyone needs to talk to me, they can reach out to me through that as well. So, that’s thecoursewhisperer.co/wptonic.